Very true on the headspace thing. Always need to check that with light strikes. The brass “shavings” don’t concern me. Prob would have never noticed if I hadn’t pulled it for the sake of comparison. Shot the 16.5 Proof Carbon barreled Fix today. Damn what a gun. I shot a 10 round group and two nine round groups. The really high left was the only 130grn I shot aiming at the same point as the 10 rounds of 147 below it. Mind that all 3 groups each has 3 different charge weights. I was doing load dev more than shooting for groups. I shot seated off a bipod with no rear bag. 100 yards indoors. The 5 round group in the middle was sighting it in. I know I can do a lot better but I was shooting for chrono data more than accuracy. Now I’ve got some loads I want to test for accuracy. Note: magnetospeed V3 is 10000 times better than Caldwell chrono. I didn’t have any pressure signs but stopped because I didn’t want to push it. I felt like I should have had pressure signs at these numbers but it just wasn’t there. 16.5 inch Proof Carbon 6.5 Creedmoor Fix: 147grn at 2572 FPS. 2500 elevation. That’s crazy. Only 68 rounds on the barrel too. So it should speed up. But I want my awesome peterson brass to last so I’m going to dial it down to 39.9-40.9 by .01 grain increments and find the sweet spot. That should be around 2450 which makes me happy. So what exactly did your rifle end up liking the most? I guess since you were just chrono'ing it not a big deal but I start losing track when mixing groups like that. Did you keep notes on the order and location of the hits by any chance? Hahah! It worked! Not sure if the gun will fire now But, it def made the bolt lift not so heavy. follow this video to a completely stripped bolt, when you lock it into the over cocked position (the rollers) just over power the spring and spin it a few times, I did it about 10x and put it all back together. Make sure it’s oriented correctly, and I don’t get a twang anymore dry firing, as well “as” heavy of a bolt. I didn’t want to over do it, but it seems to have worked. Shooting tomorrow. Will post back. Actually now that I’m thinking about it, Stache, maybe you could wind it up? Thus, striking the primer harder? I may be way oversimplifying your problem... but, I’m pretty sure you’re just winding this spring up when you pull the bolt back and the spring is driving the bolt into the primer once the sear is contacted... Again. Grain of salt. Pharmacist. Again. Grain of salt. Pharmacist. ^^^ Best disclaimer ever. Haha. Hope it works for you man. Let us know how it shoots... as long as it does't cause light stikes might be something worth trying. Interesting solution. Alright... can you delete posts? Im an idiot and pulling all of the grains of salt lol. I just took it all apart again, even down to the lugs... the spring tension is set from q. I was just spinning it in its housing they have a plastic base plate holding it in place, I must have not been hearing the twang as it was sitting on the sand bag, but I swear it was lighter. Lol. Literally didnt do anything... apologies. Still shooting tomorrow. Get back to you guys. Check the top left hand corner. Those are the six colors they offer. And I believe you can mix and match. Doesn’t have to be all one color. Where did you get that velocity number for the 143 Eld X’s? Was that the factory load as well? A member here and all around good dude @jwknutson17 did some testing for science back on page 25. Here’s a screen grab. It’s a 17 inch Bartlein/Tooley barrel doing 2500+ with factory 143 hunting ammo. So I’d say my estimate of 2475 out of a 16 is pretty fair. But just today my 16.5 got up to 2570 with no pressure signs with a 147 hand load. I’d say 2500 would be doable for the 143. Made it out to the range today, it's so nice going on weekdays and finding an empty range. Just trying to work on my fundamentals, I'll be honest are lacking severely, and seeing how the gun reacts to different factory ammo. 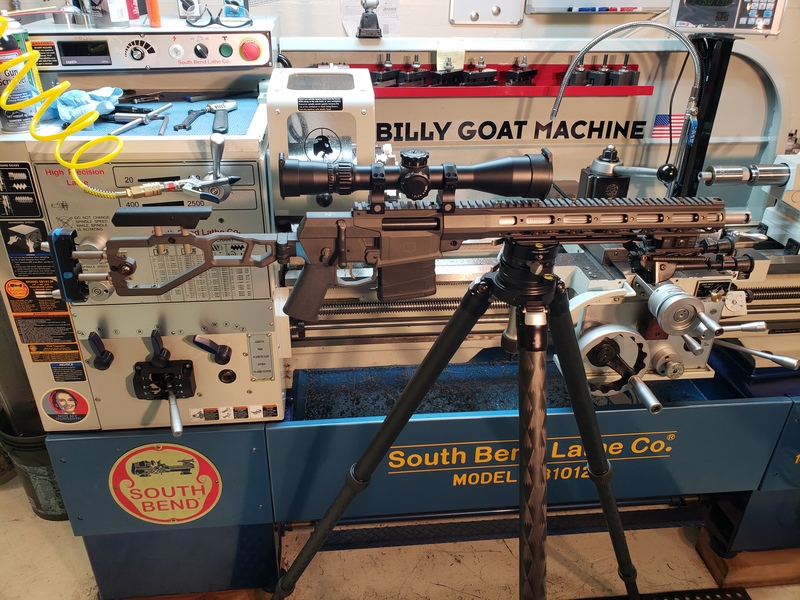 All I shot today was my 16" B/T barrel, hoping the new barrel wrench makes it in in the next week so I can give that a try compared to the using the one on my torque wrench. I shot American Eagle 150gr, Hornady Superperfomance Match 178gr BTHP, Hornady Match 168gr BTHP and Hornady Black 155gr A-Max in the order listed. The image shown without the Ballistic-X overlay is my various 100yd sighters, I forgot to list which group was which, the other three are all 200yd groups. Take these groups as more of a demonstration to my ability to shoot the rifle rather than the rifles ability to shoot good groups. All groups were shot prone, which is a position I need to work on. The more I shoot my Fix, the more I love it. One thing I did discover today, is that my scope is slightly canted to the rifle. I only noticed this after I figured out how to stiffen up my Atlas bipod to prevent me from canting the rifle . And because someone mentioned we need more pictures of the Fix itself, I've included a couple of the rifle. If you naturally cant the rifle when you shoot, the scope shouldn't be level with the rifle. Hold the rifle how you would naturally and use a plumb line. Thats level.... doesn't matter how the scope looks on the rifle itself. Its good seeing people posting pics/range reports . I want to get that program but my computer doesn't have a cd drive. I wish they would have it for sale on a flash drive or something. I’v never heard anyone say to have a setup that is canted. I mean if it works than it works but I would rather have everything in line and plumb and use a level before the shot to make sure its dead on. Look into it. Not wrong to just level the scope with the rifle, but I typically level the scope to my natural shooting position. It is 1: more comfortable that way and 2: more repeatable. Thanks man. If you’re available. I appreciate it. I’ll PM you the info I have and just anytime you get around to it would be much appreciated. I’m sure I naturally can’t the rifle, but it feels like something is off between the scope and rifle. I feel like I’m fighting between holding the rifle comfortably and looking through the scope properly while in the prone position. Shooting from the bench feels fine though. So maybe I need to readjust it to fit better in the prone. Guess I need to film myself to see what I’m doing, maybe ask around to see if I can find an experienced shooter to help me out. Thankfully I am taking a class from @Lowlight up here in Alaska in May, so hopefully he’ll get me squared away as to what I’m doing wrong. I am taking my Fix to the class, just have to decide if I’m going to run the 16” .308 B/T barrel or 24” 6.5cm Proof carbon fiber barrel. Edit* corrected my mistake on the Proof barrel length. I’m sure I naturally can’t the rifle, but it feels like something is off between the scope and rifle. I feel like I’m fighting between holding the rifle comfortably and looking through the scope properly while in the prone position. Shooting from the bench feels fine though. So maybe I need to readjust it to fit better in the prone. Guess I need to film myself to see what I’m doing, maybe ask around to see if I can find an experienced shooter to help me out. Thankfully I am taking a class from @Lowlight up here in Alaska in May, so hopefully he’ll get me squared away as to what I’m doing wrong. I am taking my Fix to the class, just have to decide if I’m going to run the 16” .308 B/T barrel or 22” 6.5cm Proof carbon fiber barrel. That’s going to be awesome. I’m jealous. - Run the cm! Did you mean 24”? My follow up to his response is going to be... want to sell it? Yes I meant 24”..... I just can’t seem to remember it correctly. Sorry @Movistar I misspoke the length. Haha! Any proof barrel is a gorgeous thing. Pics with it and the can are in order! I’ll post some later this afternoon. Going to hit the range again after work and switch to the proof barrel. If I can remember I’ll try and time myself to see how long it actually takes to do a barrel swap. I’m going to do the same thing testing a couple different ammos too. Did a quick search and didn’t see much...how is the trigger on the Fix? I’m used to a Geissele 2 stage on my Scar 17 and AR for comparison. To me, it’s the best bolt gun trigger I’ve ever felt. But I also know triggers are subjective. Personally I prefer RRA NM 2 stage in my ARs over Giessele triggers which I tried 3 different G models and I just don’t get the hype. So triggers are a bit of a personal thing. But I love this one. 2 stage, very crisp. If you watch the Kit Badger deep dive videos (required reading and a total must for any fix owner or even prospective owner) you’ll see how they say they are all a little different but they rest each one for creep and for crispness. Geissele uses a heavier first stage and a lighter second stage (for example, the SSA-E has a 2.3lb first and a 1.2lb second stage). The Fix trigger is almost the inverse of this with a VERY light first and a heavier, but crisp, second stage. 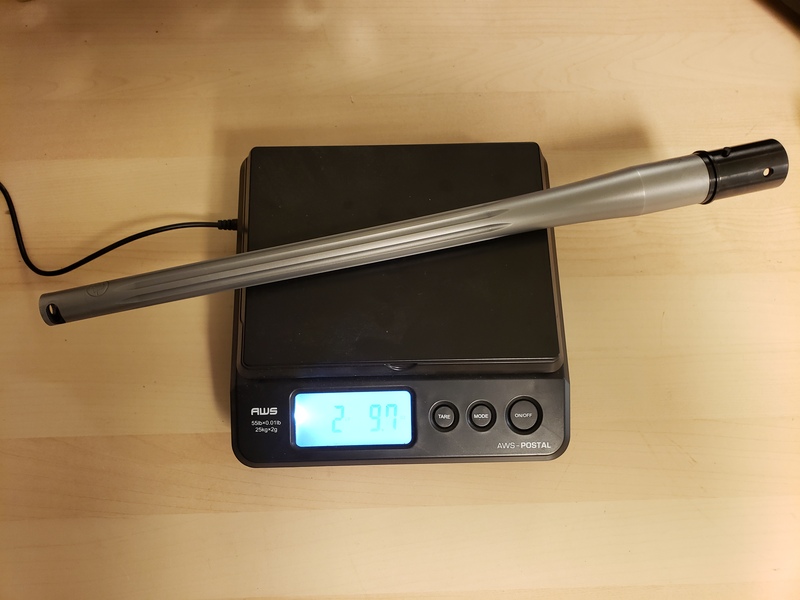 I don't know the exact weights for the fix but have heard that it breaks at ~2lbs to 2.5lbs, which makes sense, but that 2-2.5lbs is almost entirely in the second stage. I like heavier first with lighter second personally, but its a good trigger. You won't have any issues with it. Had BGM spin me up a shorty 7.5 twist creedmoor today. Hopefully ill test it next week! So I timed myself to see how long it takes to do a barrel swap and it was 9.5 minutes, not including time to take pictures. The hardest part was pulling the .308 B/T barrel from the receiver. Purely timed myself out of curiosity. Sadly I only had 3 different factory loads to shoot today out of the 24" Proof, I got the length right this time. They were American Eagle 120gr open tip match, Hornady Match 120gr ELD and Federal Gold Medal Match 140gr Sierra Matchking. I did pull a round in my grouping for the Hornady and Federal, as seen in the pictures, so those were only factored as 4 round groups. It definitely seemed to prefer the Federal GMM over the other two. I picked up some Hornady Match 140gr ELD and Hornady Superformance 129gr SST. Might be able to make it to the range again tomorrow to see. So I realized looking through my group photos between the .308 and 6.5 barrels, it appears that even though I use the same scope with both, just re-zero at 100yds for each round, that at 200 yards I have a consistent drift to the right for every round I try. My goal on the next range trip is to try and do a tall target test to see if my scope is tracking straight, and to see how the impacts track as I adjust the scope. Any thoughts on what I should look at, please let me know. The only thing I noticed when I did the barrel swap is some rubbing where my scope rings mount to the rail. Lol plenty of people on here getting .5-.75 MOA, more than likely it's a fundamentals thing for people who are only getting MOA. I’ll save you 55 pages of reading. The gun shoots great. It isn’t EASY to shoot tiny groups with because of its lack of weight, particularly in 308 (lighter by a lb and more recoil) but guns have been sent back to Q who shoots half MOA with them. I also noticed on a podcast KB said they shoot every gun for accuracy before it ships. They shoot 5 round 100yd groups. 6.5 is all under half MOA easy and the 308 are right about a half or they don’t ship. It’s pretty evident that this gun while capable in the hands of people used to them (Q) it exposes the lack of fundamentals in others. It isn’t an easy gun to shoot. But I love mine. A lot. sweet. Where the story with the brake? That’s a tight blend. Are you keeping your other Bartlein you had them spin? Other people have posted good groupings. Mine have been around .5-1moa at 100yds and 1moa at 200yds. I know I have poor fundamentals and need to work on me to tighten up the group. The rifle is a hammer, and I love it. Opened an RMA with the distributor/importer as well as on Qs end, this is the response I got from the distributor/importer. I’m sure you can imagine what my response was. So this is on going. Does anyone else’s bolt droop so much at the front it hits the feed ramps on the barrel extension and is pushed up into the barrel extension? Because mine sure does. I’ve forwarded all this onto the people that need to see it I just don’t understand why it is such a big deal to get me a new bolt. Clearly there’s something wrong here with the shroud to rails fit or the bolt to shroud fit and it’s drooping too much at the front and getting caught on things and running into the feed ramps. On a serious note, my bolt is the same way.... with no mag inserted. I insert the mag and it’s straight as an arrow. I don’t think what your video is highlighting is a problem in my opinion. Regarding feeding issues, if I run my bolt fast it’s fine. It’s slow that seems to occasionally cause issues. But aren’t pretty much most bolt guns that mag feed like that? On a side note, sounds dry to me. Lube that sucker up. I shot my Fix today and finally took some pictures of groups since I downloaded the new Ballistic-X app. I shot three groups of Federal Gold Medal one group was 168g and two were 175g. Then I shot two more groups of a 155g load I’ve been working up for the rifle just trying to finish up seating depth. I would take that gun!